A day trip from San Francisco to Carmel takes you on two of California’s most scenic roads. First, you’ll cruise down the coast on the Pacific Coast Highway, and then take 17 Mile Drive that leads to Carmel-by-the-Sea. Take a look at our favorite Carmel tours for a stress-free day trip! Driving down the Pacific Coast Highway is one of our favorite past times. We’re so passionate about day trips on the PCH that we’ve already written about how to get to Monterey from San Francisco on this travel blog. But we wanted to make sure to emphasize there is another town, as equally breathtaking as Monterey. Just head a little farther south to find a small enclave called called Carmel by the Sea. Between Carmel and Monterey is the 17 Mile Drive. This scenic roads hugs California’s coastline as it cuts through the quaint coastal town of Pebble Beach. This town is most famous for hosting the Pebble Beach Pro Am Golf Tournament. Interestingly enough, the 17 Mile Drive is part of a privately owned road. Non-residents of Pebble Beach must pay a fee to ride along the 17 Mile Drive. This romantic drive of California’s coast is one of the best routes to get from San Francisco to Carmel via Highway 1. Once in Carmel by the Sea, you can explore the European inspired Carmel Village in the “downtown” area. Here you can walk amongst cottage-style businesses filled with quaint bistros, art galleries, and boutique shops. Bixby Creek Bridge on the PCH is just south of Carmel. What is the distance from San Francisco to Carmel? You’re looking at a drive that’s a little over two hours, each way, to get from San Francisco to Carmel by the Sea. This sleepy coastal town is about 130 miles south from San Francisco. How far is Carmel from Monterey? 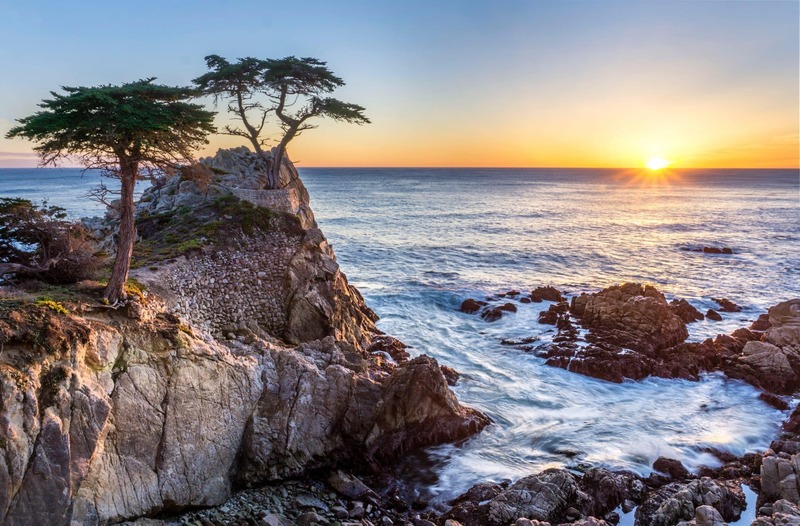 Most travelers find themselves heading to Carmel by the Sea after visiting Monterey because of just how close these two waterfront towns are to each other. The distance from Monterey to Carmel is less than 10 miles (about 20 minutes away). This makes visiting Carmel well worth a visit if you find yourself on a day trip to Monterey! The Lonely Cyprus along the 17 Mile Drive is one of the most iconic stops from San Francisco to Carmel. Enjoy the scenic drive of Carmel with Extranomical Tours. The beautiful drive to Carmel by the Sea begins after a long lunch break in Monterey. Your drive will take the most scenic entrance to the 17 Mile Drive, though Pacific Grove. Along the drive you’ll have two photo stops along this memorable stretch of highway. First up will be a photo stop at the Lone Cyprus. Sometimes, this famous tree is incorrectly referred to as the Lone Oak. The Monterey Cyprus only grows in this region of Monterey County, so the trees are uncommon outside of Northern California. The Lone Cyprus is particularly special because this 250 year old tree sits on a lonely outcrop of rocks that overlook the Pacific Ocean. On this cliff the Lone Cyprus is whipped by the brutal Westerly WInds and massive waves during storms. Next up on the 17 Mile Drive is a visit to the Pebble Beach Golf Links Pro Shop. Golf fans will instantly recognize this golf course as the namesake for the Pebble Peach Pro-Am PGA Tours. The Pro Shop actually has an amazing view of the 18th hole green! On the other side of the 17 Mile Drive will be the picturesque town, Carmel by the Sea. You’ll have an hour and a half to explore art galleries filled with local artists, shop at boutique stores and enjoy a meal at gourmet restaurant. Tower Tours is a small local tour company with big bus tours from San Francisco to Carmel. Bigger buses means more availability, especially if you’re looking for last minute tickets to Carmel. An expert driver will take you down the PCH on the way to Monterey, where you’ll stop for an extended break to explore historic Cannery Row and enjoy lunch from the comfort of a waterfront restaurant. After lunch, you’ll deviate from California’s Highway 1 and onto the privately owned 17 Mile Drive. Along this drive you’ll stop for photos of the Lone Cyprus before continuing on to Carmel by the Sea. The distance from Carmel to San Francisco on the return trip will be about 2.5 hours. Tower Tours will bring you back to San Francisco via Silicon Valley. The bus is fully equipped with WiFi, so you’ll be able to start sharing pictures from your day trip on the ride back! Cruise down the PCH from San Francisco to Carmel. The beauty of the San Francisco to Carmel drive will not be lost on this budget tour. Especially if you get a 17 Mile Drive tour included! Gray Line Tours offers three different photo stops along this amazing road lined with expansive views of the Pacific Ocean and a sea of mansions. Your first stop will be looking out onto the Pacific Ocean from Bird Rock Beach. This beach is named after (you guessed it) the insane amount of marine birds nesting on the outcrop of rocks in the Pacific. Next, you’ll stop to take photos of one of the most famous trees in the world — The Lone Cyprus. This 250 year old tree has withstood the test of time. After centuries of being wind-whipped by strong gusts and battered by the brutal waves of Pacific the Lone Cyprus still stands. A testament to the perseverance of California’s natural beauty. Your last stop along the 17 Mile Drive before arriving from San Francisco to Carmel, will be at the world renowned Pebble Beach Golf Course Club House. Pebble Beach is home to the annual Pro-Am competition, but you don’t have to be a fan of golf to appreciate the beauty of the greens. You’ll have a couple of hours to explore the quaint Carmel Village, a town where Clint Eastwood was a one-time mayor, before heading back to San Francisco. Traveling from Carmel by the Sea to San Francisco on the way back will be a breeze after such a long day exploring. If you’d rather stay in the Bay Area during your trip to the city, book our local-led tour to explore the best of San Francisco!